What caught firstly my attention concerning “Die Gesellschaft der Grauen Herren” was the band’s name. Some of the more active readers of Metal-Maniac and the listeners of the MetalCast Show are aware about my passion for the German language. Well, I’m far from being fluent, but I’m learning it, not only because of my mentioned passion for the idiom (as well as movies and bands) but also as a result of an obligation for a PhD I’m pursuing. The second aspect that draws my attention is that the band play, as they dub, “blackened progressive metal” or, for others, an avant-garde view of the dark metal genre with lyrics about intellectual experiences, humanity and romance. I had to give it a try. As I listened to their song on Bandcamp, I felt impressed and decided to contact the band for an interview. And I ended up with a review as well. “Imagines Itineris” is the band’s début album, released on this year, 2014. 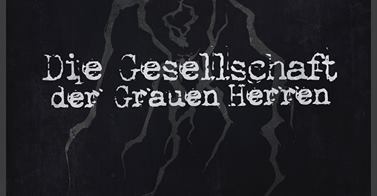 Die “Gesellschaft der Grauen Herren”’s demo had the same name and was came to reality in 2010. I had high expectations from the band, hence the style as well as the thematic. When listening to the album, I wasn’t disappointed at all! Before I start talking about the sound, I should add that Imagines Itineris clocks over one hour and tem minutes! Don’t you just feel a bit, just a tiny bit ripped off when you buy a full-length album which has a length just under thirty minutes? I know I do. The album feels very theatrical and well done. Featuring both male and female clean vocals as well as black metal shrieks, fast and hypnotic guitars, a very well solid work when it comes to the drumming and the bass, Imagines Itineris is an album that will surely please experimental metal fans. Don’t get me wrong, this isn’t one of “those” bands that simply throw musical elements and noises to make their sound weird and call it experimental. You can sense that everything here has a purpose. The music here is well-played as well as well-produced. The musicianship, for a début album, is impressive. The songs are beautifully done and lively, fascinating. One more time I have to add, the guitars here sound so alluring, you almost feel like you’re on a dream. This is indeed, in my modest view, a gorgeous release. As I’ve told the band, I’m relieved to see that there are still bands that play with their feelings, with character and not just copying what’s hype lately. Again, in my humble opinion, I truly believe that you should support “Die Gesellschaft der Grauen Herren”. They are worth your time and money and I really don’t want to see this band simply fade away like so many other great bands. Hopefully they’ll be active and receive enough support throughout the years.